In this episode, Lisa explains how knowing your strengths, and the strengths of others, can help you get along better at work. You’ll also find out what grizzly bears have to do with the workplace! In this episode, you’ll get a conversation guide you can use in your one-on-ones as a way to prevent conflict at work. The root of most conflict and consternation at work is missed expectations. As a leader, you have expectations of your team and they have expectations of you. Interestingly, built into each of the 34 StrengthsFinder talent themes, you’ll find some inherent needs and assumptions. For example, imagine an employee named Connor. He’s on your team and he leads through the Includer talent. He needs to know there’s room for everyone’s opinion — including his. No surprise, since it feels good for an Includer to be included. Each talent also often comes with the assumption and expectation that others might notice or value the same thing they do. It’s natural for all of us to not realize how unique each person’s assumptions and expectations are. So in that example, Connor would notice that someone’s ideas are being ignored. And he’d probably expect you, as the manager of the team, to rectify the situation. And then when you don’t, he might wonder why you’re such a jerk to flagrantly ignore the situation. Meanwhile, you lead through Analytical, Activator, and Command and it never occurred to you that someone has an issue. After all, if you had an issue, you’d say something quickly and directly. The source of most conflict in the workplace is missed expectations. Usually these expectations are never spoken of. It’s like we keep secrets in our minds. Well, not exactly. But we often assume others think the way we think or instantly understand what we expect from them. Our natural way of thinking and acting is so innate that we often don’t notice we’re doing it or that it’s different from anyone else’s perspective. Here’s an example to illustrate how conflict comes from missed expectations. I went to Glacier National Park for vacation. The most exciting hiking trail is called the Highline Trail. It’s one of those trails that is only the width of the footpath. Teeny. There is a rail attached to the face of the mountain so that you can hang on because if you are the least bit afraid of heights you will think you are about to fall off the mountain to your death. So of course that is the trail I wanted to go on! We showed up at the visitor center ready to go, but there was a sign that said the Highline Trail is closed. Boo! 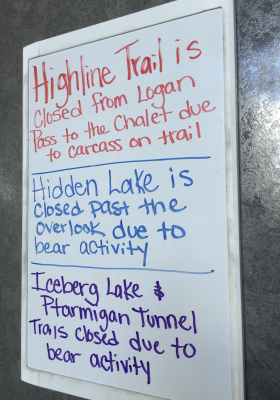 Written on the whiteboard, it said they closed the trail because there’s a carcass in the way. I was so bummed because it was THE attraction I wanted to experience at Glacier. From the View of the Manager. Now let’s break this example down in the context of expectations. Let’s take the person who closed the trail. Imagine they are the manager on the team. They had to look out for the best interest of the team. They were afraid that hikers would be attacked because wildlife were trying to eat the carcass and we might be in danger if we got anywhere near the carcass. This is quite similar to what happens to managers at work. As a leader, you have to consider the broadest perspective. Without fail, you have conflicting demands — the things people want from you. And those things are rarely in alignment. A team member wants something different from you than your peer. And that request is different from what your leader is asking for. And that’s different from what your customer has been requesting. Inevitably you have to make tough decisions that disappoint people, in the same way that the park ranger’s decision disappointed me at first. From the View of the Team. Now, imagine what’s going on in the minds of the grizzly bears, wolves, and mountain lions on the team. Where else do you get a business conversation that encourages you to get in the mind of a grizzly bear. Ha! If they see a carcass on the trail they are going to get it. If a tourist comes by, they will see the tourist as a food thief. They see someone who threatens their survival. They will assume that I want to eat that carcass and they will attack me. It is an incorrect assumption, but if you get in the mind of a mountain lion or grizzly bear you can absolutely understand. Likewise, you have seen this at the office before. This is why silos exist inside of companies. People are protecting information or status quo in order to ensure they can survive or thrive in their environment. From the View of a Colleague in Another Department. And then there’s me as a character in the example story from the hiking trail. I represent your disappointed colleague, visiting from another department. When I got the news that the trail was closed, I pouted for a minute (only in my mind, not out loud). I lamented the fact that the mountain lion and grizzly bear cannot understand me and just let me pass by. This is very much what happens on the job when you imagine people in other departments at the office. You wonder if they are blocking your progress on purpose. You wonder if they are ignoring your request or failing to trust you for any good reason. You know all you’re trying to do is get your project further down the hiking trail. Now to bring this (sort of silly) hiking metaphor into action, take a look at how StrengthsFinder can help you overcome these assumptions and expectations that lead to disappointment and conflict. Each party is probably doing the best they can with what they have or what they know. Very few people come to work intending to sabotage. If you are lucky enough to know each other‘s StrengthsFinder talent themes, consider that person‘s top five themes to give you perspective on where they might be coming from. It will help you look for the good they are attempting to bring to the situation. 2. Get further into the psyche of the person you’re working with. Understand what each person’s talent themes need at the office. To offer you a tool for this, I posted a conversation guide on the Resources Page. It will help you prevent conflict by directly using StrengthsFinder language. 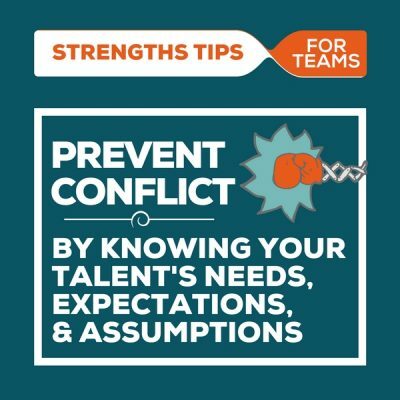 Look for a thumbnail image that says “strengths tips for teams” at the top and “prevent conflict” in the middle. This document outlines the inherent needs that every one of the 34 talent themes has. If you can have an open conversation with each person on your team about these, you can prevent these missed expectations before they happen. If possible, you will want to have this conversation in a one-on-one meeting when you’re not in the middle of a conflict. Knowing these things in advance will help you not assume things and will help you understand your team members’ natural assumptions. If you use this guide during a conversation, here’s what you do: Have the person look at their top five talent themes on the document. See if the Needs listed for their top five resonate with them. For those that do, ask them about what they would naturally assume or expect based on that need. For example, if you have a new team member who leads through Consistency, he might expect that you have documented processes. That’s one of his needs listed in the conversation guide. Then, when you ask about Assumptions, he tells you that he assumes he can and should enforce policies related to these processes. Imagine how good it would be for you to know that if he’s replacing someone who was willy-nilly about things. Your new team member will likely be frustrated by the cobbled-together mess he’s inheriting. And people from other departments will be surprised by his policing efforts. Yet if you know these things before conflicts happen, you can turn it around into a celebration of how he’s going to get an efficient operation established. If you want to make this Expectations and Assumptions one-on-one ultra–effective, come to that conversation having already prepared your own document. Of course, it’s always good to be self-aware. It also allows you to show them an example so that they know what you’re getting at. It keeps them from raising the skeptical eyebrow wondering why you’re asking these things. Most of all, the reason to look inward first is that you have your own assumptions and expectations that you naturally view the world with. It’s important to know these because it affects the way you lead. For example, I expect that if someone sees something broken, misspelled, or incorrect, that they will fix it in the moment, regardless of whether it is their job description or not. This expectation comes from my Maximizer talent. And if you look at the document I made for you to download, you’ll see that there’s an inherent need that talent has — it’s to respect quality as much as speed and quantity. On the other hand, It’s perfectly reasonable for someone on the team to take a note of something broken and plan to fix that thing they noticed … later. Well, it’s reasonable to them. Yet it won’t feel reasonable to my Maximizer talent theme. This is exactly why it’s helpful for you to know how your expectations might be different from your team members. And, it’s critical that you get comfortable verbalizing them to each other so that it’s not only about you making demands of them. It’s about an open conversation so you understand where each person is coming from and you can avoid the conflicts before they happen. In all directions. To close out, here’s one more example using the Connor with the Includer talent and the manager with the Analytical talent. Imagine you’re the manager and you assigned a research project to Connor. He starts by collecting information from peers who are in a similar role. He gathers feedback from customers, from peers, and from end-users. Meanwhile, you are waiting for a spreadsheet to help you make a Go vs. No Go decision by using charts and graphs and data. He assumes that “researching” involves human inputs. While your Analytical talent naturally leans on data when you’re researching for insights. Both are natural assumptions. Connor, the Includer, uses relationships to inform decisions through people‘s past experiences and feedback. You, leading with Analytical, find truth in data. One is qualitative. One is quantitative. Both are valuable. And if you don’t know this about each other, you’ll drive each other crazy! And of course, if you do know this about each other, you can make a powerful partnership. Speaking of data, here’s a bit of research to close out the topic. This is from Gallup’s Q12 Employee Engagement studies. They found that Employees who regularly apply strengths at work are 5.1x more likely to strongly agree that they know what is expected of them at work. Interesting, isn’t it? That makes a direct and unexpected connection between the application of strengths and clear expectations. If you want to use the document I made for you to explore Assumptions and Expectations according to each person’s StrengthsFinder talent themes, get it at the Resources Page. Look for the “Preventing Conflict” image. Remember, the root of most disappointment and conflict at work is unmet expectations. You can get ahead of that by using StrengthsFinder to explore these default assumptions and expectations with each person on your team. 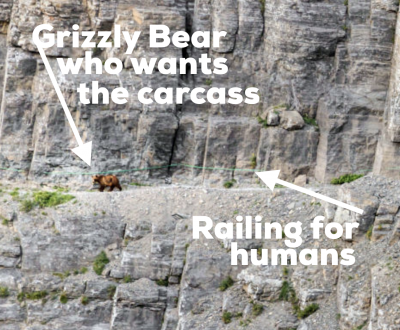 Glacier’s Who Eats Who chart – just for fun since you might wonder who was interested in that carcass.